The “Anren Shui” 安忍水 (literally means water to pacify and to endure), commonly known as the “Salt Water Cure”, has always been a fascinating subject for the feng shui students, because by placing a few copper coins in a glass of salt water, they can see the resultant chemical reaction and interpret this phenomenon as the “sha qi” of the 5 Yellow Earth or the 2 Black Earth has been neutralized by the Metal/Water in the Anren Shui. It is especially appealing to the “scientific-minded” students because they can see correlative thinking used in feng shui being expressed physically, but is there a need for this “evidence”, to confuse correlation with causation? 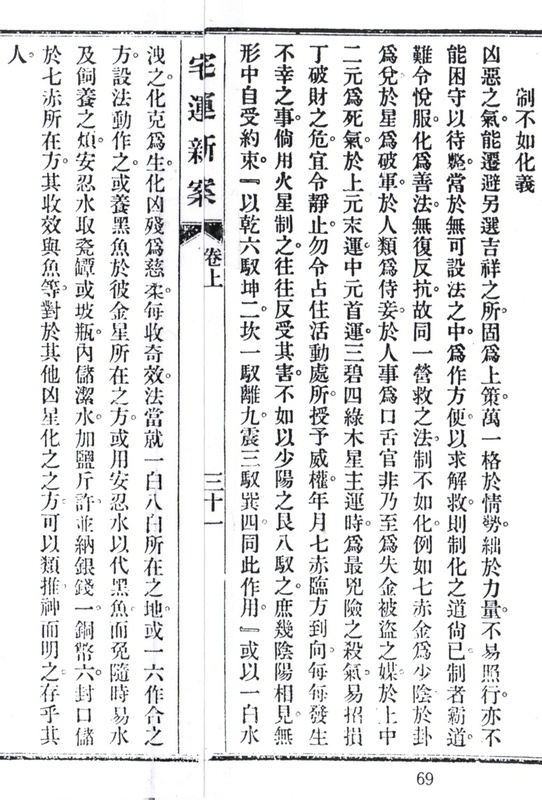 According to the book “Zhaiyun Xinan” 宅運新案 (New Case Studies of the Cycles of Luck of Dwellings), a Flying Star classic written by You Xi-Yi 尤惜陰, in the chapter entitled “Zhibu Ruhua Yi” 制不如化義 (The meaning of “to overpower is not as good as to neutralize”), the Salt Water Cure is just an expedient way to show off correlative thinking, it would have been more natural and more visually pleasing to use fish in an aquarium (You recommended using either a 1:8 or a 1:6 ratio of fish). I don’t have the time to translate the whole chapter but if you can read Chinese, it is quite enlightening to know from reading You’s words, that to transform or to change our attitude to a situation through our awareness is quite often more effective than trying to control or to change the same situation when it is physically impossible. Also according to You, the “Anren Shui” is used to neutralize the negative effects of the 7 Red Metal out of time rather than the 5 Yellow Earth or the 2 Black Earth. It makes sense if we take a look at the Five Phases relationship and the idea that to “to overpower is not as good as to neutralize”.